School menus for the month of October are now posted. The menus include daily breakfast and lunch offerings, as well as prices for meals and a la carte items. Don’t forget! 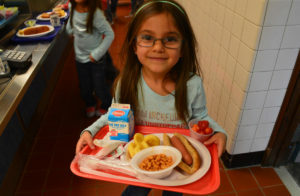 Students can now purchase Grab-n-Go Breakfast in the elementary schools. There are daily specials on this menu for students who would like to buy breakfast on the way to their classrooms in the morning. Items include individually wrapped waffles and pancakes, bagels, or muffins. There will also be fresh fruit, milk and other snacks available.